Apple HomeKit technology provides an easy, secure way to control lights and more from your iPhone, iPad or iPod Touch. Free "Leviton Decora Smart Home" app provides advanced lighting control settings including fade rate, minimum/maximum brightness, LED response activity, bulb type selection and more. Engineered to work with sensitive, low-wattage bulbs, ensuring "off means off". 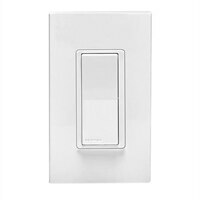 It uses the latest generation of Leviton's dimming technology for smart lighting control for a single LED bulb in a hallway or a strand of holiday lights, ensuring LEDs do not glow when off. Rated for LED and CFL technologies up to 600 Watts with support for legacy incandescent lighting loads up to 1800 Watts.